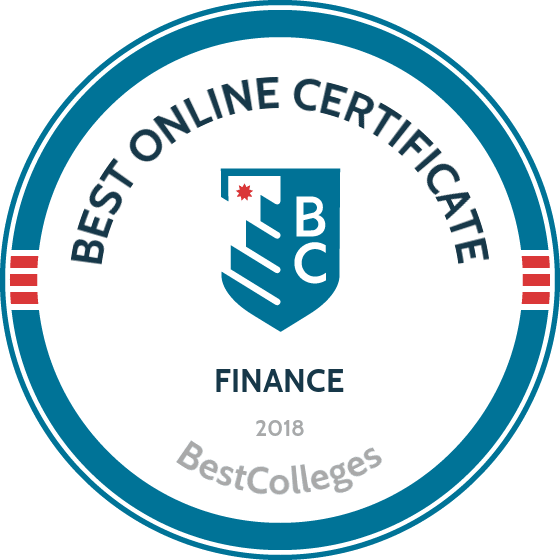 What Are The Best Online Certificate in Finance Programs? What Will I Learn in an Online Graduate Certificate in Finance Program? What Can I Do With a Certificate in Finance? In order to keep up with the latest industry trends and technology, financial institutions need professionals who are continually improving their skills and knowledge. An online graduate certificate in finance can help current financial professionals advance their careers, or it can introduce new financial recruits to the field. No matter the case, the demand for professionals working in finance is strong. Based on information for financial analysts and financial managers, the U.S. Bureau of Labor Statistics (BLS) projects that finance jobs will grow between 7% and 12% over the next seven years. Harvard, located in Cambridge, Massachusetts, is of the nation’s most prestigious universities. The school offers quality undergraduate, graduate, and graduate certificate programs through its Harvard Extension School. Harvard's online offerings include two graduate certificate programs in finance: the principles of finance certificate and the corporate finance certificate. Both programs are designed for professionals working in finance and related fields. Students learn financial theory and practice. The principles of finance certificate provides students with a broad understanding of financial terminology, as well as training in budgeting, risk management, and investment strategy. Graduate certificate in finance online course topics include corporate capital structure and mergers and acquisitions. Graduates can communicate important financial information to shareholders and can use that information to make decisions. Students must complete four courses and earn a minimum 3.0 GPA in all courses to earn a certificate. Students generally complete these programs in less than two years. Boston University is a private research institution that is home to nearly 18,000 undergraduates and 15,000 graduate students. The university began offering online programs in 2002 and now offers dozens of programs across many disciplines at the undergraduate, graduate, and doctoral level. Boston University’s graduate certificate in finance online is a 16-credit program that's offered online, on campus, or in a blended format. The curriculum teaches working professionals how to make better strategic decisions for their companies. Students must complete three core requirements, which cover financial markets, mergers and acquisition, and investment analysis. One elective course is also required. Learners complete the program in an average of nine months. The program is offered through the school's Metropolitan College. Credits earned through this certificate program are applicable to graduate programs offered at Metropolitan College. Students should check with the college about financing and financial aid options. Colorado State University, founded in 1870, is a land-grant university that offers dozens of online programs through CSU Online. Colorado State’s graduate certificate in finance online provides professionals with an understanding of corporate finance, portfolio management, international finance, and credit markets, giving them the ability to make financial decision in a variety of business environments. The curriculum uses case studies, which allows students to use what they learn in an applied format. Course topics include security valuation, corporate risk management, exchange rate behavior, and more. The 11-credit program is offered entirely online, and all courses are taught by faculty from the Department of Finance. All credits earned in the certificate program with a minimum 3.0 GPA are applicable to the university’s online master of business administration program; completion of the certificate program does not guarantee admission to the MBA program. Stony Brook University, founded in 1957, is a public research university and is part of the State University of New York system. The university is home to nearly 18,000 undergraduate and nearly 9,000 graduate students and offers a number of online programs through its School of Professional Development. Stony Brook’s online graduate certificate in finance is an 18-credit program that prepares students for successful careers in financial management through a curriculum that teaches skills in finance, accounting, corporate finance, government regulation, and other topics. Students must complete two core courses: one in finance and one in financial accounting. Students choose the remaining required courses from a pool of electives. The program is designed for working professionals, with many courses offered online and in the evenings. Students can apply earned credits to Stony Brook’s MBA in finance, however, admission is not guaranteed to learners who complete the certificate program. Penn State University, founded in 1855, is home to more than 40,000 undergraduate and 6,400 graduate students. The university also has 19 branch campuses located around the commonwealth and offers more than 125 undergraduate, graduate, and certificate programs through its online World Campus. Penn State’s online online graduate certificate in finance is a nine-credit program that provides administrative professionals working for governmental or nonprofit organizations with an introduction to the basics of finance, budgeting, financial management, and accounting. The program is offered entirely online and can be completed within a year. Graduates are prepared to pursue careers in budget analysis, financial planning, consulting, and accounting. Financial aid programs are available to military veterans. Golden Gate University was founded in 1901 and is located in San Francisco’s Financial District. The school is a private, nonprofit university that is committed to professional development. The university is home to more than 6,000 students who study business, law, accounting, and taxation. Golden Gate University’s graduate certificate in finance is a 15-credit program that is offered on-campus and online. The curriculum provides students with a solid grounding of finance basics, which prepares them to earn positions in the field and make better strategic decisions. Students must complete a core course in corporate finance, which introduces concepts such as capital budgeting, financial risk management, and international finance. Learners must also complete four additional courses in either finance or accounting. Golden Gate is not currently authorized to offer online programs to students living in Alabama, Arkansas, Delaware, Minnesota, or Wisconsin. City University, founded in 1973, is a private, nonprofit, regionally-accredited institution that is dedicated to educating working professionals and transfer students. The university boasts numerous online bachelor’s programs and provides educational opportunities for veterans. The school enrolls more than 3,000 undergraduate and 2,000 graduate students. City University’s online graduate certificate in finance is an 18-credit program that offers an introduction to corporate and organizational finance. The program covers topics in investment strategy, banking, finance basics, and trading. Students are challenged to apply their learning to case studies. The program is offered entirely online, and credits earned can be applied to some graduate programs. Financial aid is not available for students interested in this program. Arizona State University is one of the nation’s largest public research universities. The school was founded in 1885 and is located in Tempe. ASU enrolls 42,000 undergraduates and nearly 10,000 graduate students. Arizona State offers its executive certificate in global finance through the Thunderbird School. The nine-credit program offers a review of global finance for working professionals, experienced executives, and post-MBA students. The curriculum allows MBA graduates to expand their knowledge base, improve their marketability, and enhance their ability to formulate smart financial strategy for their firms or organizations. Students must complete two core requirements in applied and multinational finance and one elective. Learners must also participate in weekly discussions and score at least 80% or higher in the end-of-course assessment. Southern New Hampshire University was founded in 1932 and is located in Manchester. The school is a private, liberal arts university. The institution enrolls more than 3,000 undergraduate and 1,000 graduate students and offers more than 200 online programs. Southern New Hampshire University’s graduate certificate in finance is an 18-credit online program that is designed for experienced professionals already working in the field, as well as other managers and business leaders who are seeking knowledge in finance and accounting. The program’s broad curriculum offers students a foundation in topics like financial management, accounting, investment strategy, portfolio management, and quantitative analysis. Southern New Hampshire University offers a 25% tuition discount for U.S. service members. The discount is available to either full-time or part-time military students and their spouses. Empire State College, founded in 1971, is located in Saratoga Springs, New York. The school is a public university that is part of the State University of New York system. Empire State is home to more than 10,000 undergraduate students and 1,100 graduate students. The university offers online programs through its Center for Distance Learning, the School for Graduate Studies, and the School of Nursing. The university’s certificate in global finance is a 15-credit program with an international focus. The program trains students for successful careers in international business by building their competencies in topics including multinational business dynamics, financial strategy, international management, and financial markets. Each of the five required courses addresses business topics through the lens of the global marketplace. For admittance, students must have a background in accounting, economics, statistics, or financial management. Credits earned in the program may be applicable to graduate programs offered by Empire State College, but completion of the certificate does not guarantee admission. Financial Reporting and Analysis A foundational course for most online certificate programs, this class teaches students how to write financial statements according to strict accounting rules. Students will also learn to review and analyze financial statements so that companies can make informed economic decisions. Economics Economics courses cover consumer behavior, market forces, and financial trends. By introducing them to basic microeconomic and macroeconomic concepts, these courses teach students how business decision making derives from basic principles of supply and demand. Capital Markets and Investments Professionals working in finance must have knowledge of modern portfolio theory, which is about how portfolios can be structured in order to maximize returns and mitigate risk. This course will explore topics such as capital markets, securities trading, and financial instruments. International Finance This course explores how international trade is conducted and how financial managers do business overseas. Topics include foreign direct investment, multinational corporations, and foreign exchange exposure. The class also looks at trends in international banking, exchange rates, and the cost of doing business in various parts of the world. Finance professionals are highly motivated to succeed. Students who acquire a graduate certificate in finance have access to a broad range of professional opportunities across numerous fields. Financial professionals will have the knowledge and skills required to excel in areas such as risk management and private equity. Outside the industry, they will be poised for success management consulting, nonprofit management, and related fields. Budget analysts serve their organizations by helping to formulate financial strategy and by establishing best practices. They monitor institutional spending and prepare budget reports for use in a variety of business environments. Financial managers oversee the financial operations of businesses and organizations. They are responsible for preparing and reviewing financial reports, conducting financial forecasts, and investigating ways to improve company profitability. Personal financial advisors work with individuals to help them plan their long-term financial strategy. They consult with their clients to make smart decisions regarding investments, college savings, tax planning, and retirement. The BLS projects continued growth in financial services through the year 2024. Predictably, the best job markets in the industry can be found in the nation's traditional financial hubs — New York, Chicago, and Boston — along with California and Texas. New Yorkers earn the highest mean annual wages in the industry, while Texans earn almost $40,000 less. Aside from location, your experience also impacts the annual earnings of financial professionals. The following table features BLS data for the best-paying states in finance. Students who complete an online certificate program in finance have the option of furthering their studies. Many schools permit students to transfer credits earned through a certificate program into an associate, bachelor's, or master's degree. Students considering this option should inquire about credit transfer rules before starting any program. It is also important to note that even in circumstances where certificate credits can be transferred to other graduate programs, completion of a certificate does not guarantee admission to other programs. Bachelor's of Arts / Bachelor's of Science in Finance: A bachelor's of arts or bachelor's of science in finance is a minimum requirement for many jobs in financial services. These degree options are popular for those pursuing careers in corporate finance or financial planning and allow students to pursue further studies at the graduate level. Bachelor's of Science in Management: Students can leverage their background in finance to pursue a more broad-based degree in business management. These degrees educate students in the basics of economics, statistics, accounting, human resources, and strategic decision making. Master's of Business Administration: A master of business administration (MBA) offers a springboard for professionals to take on leadership roles in business. Aside from commanding higher salaries, professionals with MBAs possess the know-how to start and maintain businesses in a complex global marketplace. Before you choose the right graduate certificate in finance online program, you should verify the school's accreditation status. Accreditation ensures that the programs offered by colleges meet established standards for academic excellence. There are two main types of accreditation: regional and national. Most regionally accredited colleges are traditional non-profit, degree-granting institutions, while the majority of nationally accredited universities are for-profit schools that offer vocational, technical, or religious programs. Regional accreditation is generally considered the more prestigious of the two designations and guarantees that the program you choose will be recognized by the state and federal government, potential employers, and other universities. The U.S. Department of Education and Council for Higher Education Accreditation (CHEA) oversee six regional accrediting agencies throughout the United States. There are also independent bodies that accredit programs in specific disciplines. For finance, you should check that your program is accredited by the Association to Advance Collegiate Schools of Business. You can also check the CHEA website to verify your school's accreditation status. Several professional organizations offer valuable networking and learning opportunities for financial professionals. These organizations allow you to stay abreast of the latest trends and best practices in the field, while also giving you opportunities to make professional contacts that can advance your career. In addition to student chapters and discounted student memberships, many professional organizations offer career resources that can help you land a job after earning your online graduate certificate in finance. AFP works to advance the success of both individual members and, by extension, the organizations they serve. The group hosts one of the largest annual conferences in the industry, welcoming more than 6,500 professionals to the event every year. With more than 85,000 members from 140 different countries, IMA is one the largest and most influential groups for professionals in accounting and finance. The organization provides accounting certification, career resources, and publications to over 300 chapters worldwide. Founded in 1970, FMAI works to connect finance professionals working in the industry with those working in academia. Its efforts focus on the promotion of top research and the use of best practices in finance. A variety of financial aid options are available to students seeking to pay for a graduate certificate in finance online program. The first step for any student is to complete the Free Application for Federal Student Aid (FAFSA), which determines your eligibility for federal financial aid in the form of grants, scholarships, loans, and work-study awards. If traditional financial aid isn't an option, you may be able to secure funding from your employer, take out a private loan, or formulate a payment plan with your school.